This is typically a “feel good” aspect, but this one is in Earth, so we may “feel good” in this case by accomplishing something useful at work or in our business. Moon in Pisces favors creatives (and most entertainers) but feels a bit like a void Moon to everyone else. Venus Trine Jupiter brings us “luck” and may even encourage us to sign long term contracts, but the Moon does not favor this. In the end, you must decide yourself, but Piscean Moons tend to erase long term commitments. 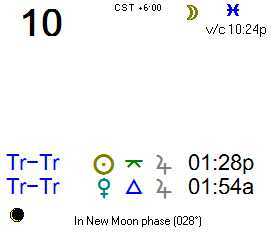 Sun is also quincunx Jupiter, and that votes against the temptation of the long term commitment. Make it a “fun day” if you can, and avoid taking anything too seriously. Though I try to stay politically neutral as much as possible, I feel I must write this short piece before too much more time passes. I am going “out on a limb” by making an early prediction of sorts. And, I note that this is not the “only path” for us. But it is one that many people may come to favor. Jeb Bush’s birthday is February 13th. That means he is in his solar 12th house, the weakest period for him (or anyone else in the same situation) all year long. Soon, he will be in his strong period. 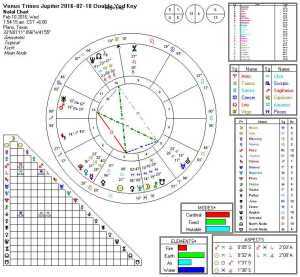 Bush’s Sun squares Algol, and Kasich’s Sun conjoins Algol. Although I may elaborate in updates to this post, I have written about Algol elsewhere. The ancients considered it the most malefic star in the Zodiac. Others may be malefic, but nothing compares to Algol.